SJOTL is now registered on Amazon Smile, and you can begin shopping on AmazonSmile with donations set up to go to SJOTL using your existing Amazon account by following this link: https://smile.amazon.com/ch/57-0929358, or by going to smile.amazon.com, searching for SJOTL when prompted, and choosing to support it as your charity. The completion of the final site work has been delayed due to the amount of rain that has fallen in recent weeks. The installation of flooring in particular has been delayed by the high humidity of the air in the crawl space under the church. Seeding of the grass parking lot has also been delayed because of the rain. Instead of seeding, the church is now planning to move forward with laying sod, since it is too late in the season for seeded grass to securely take root. Landscaping of the property should commence shortly, as soon as the grading is finished. At this time it looks like we should be able to move into the new church by Labor Day weekend. We are currently projected to be $90,000 under budget on the current phase of construction. $280,000 remains on our line of credit, and we should have $200,000 left on hand after the current phase of the construction is complete, with $350-400,000 projected to be on hand by the end of the year. The Augusta Arbor property is on sale for $425,000 after having been assessed at $350,000 in 2011. We have an interested lessee who we are presenting a lease agreement that would pay us $2000 a month as well as cover utilities and other costs for the Augusta Arbor property, and that would include an option for the lessee to buy, perhaps with incentives. 1) Buy a roughly 1600 square foot mobile unit (double wide trailer) for $50-75,000, which would be used for fellowship and office space until we could build a parish hall. It would likely take a couple months to get the mobile unit approved and in place. Until the mobile unit was in place, a tent could perhaps be used for fellowship and Sunday school. 2) Look into building an "event barn", an open structure with the frame of a barn (see examples here), which would be a permanent parish hall solution. The event barn would be 4200 square feet (the full square footage approved by the county for a parish hall) and would cost $450-475,000 to build. The barn would take around 6 months to finish, and it was proposed that in the intervening time a tent could be set up to host a simplified version of coffee hour and to accommodate Sunday school. At the meeting, a vast majority in an informal vote were in favor of moving ahead with option 2 in the form of the first step of the event barn construction process: asking area event barn builders, which have been identified, to provide plans and estimates for our own custom event barn, which would be tailored to the parish's needs. This would cost an estimated $20,000 and take a month or two, but would require no further commitment from the church. Once plans were presented, the church would decide whether or not to move forward with construction. Till the event barn is constructed or decided against (likely meaning that the church would instead purchase a mobile unit), coffee hour and church school would be held in an on-site tent. Several cautioned against making a "final decision" before we are in the new church and know what we might like to spend on finishing the interior before moving ahead with a parish hall solution. During the week of August 19th, Fr. Marcus will be moving his office to the Synesis International offices just down the street from the new church building, courtesy of Ricardo Studart. The Bishop's visit is planned for October 12th-13th. Big question for the future: which parish hall solution will have us prepared for Pascha? Tithe.ly is an app that you can download to your Android or Apple device which will allow you to make an offering from your checking account or debit card. It also allows for giving through a web link, if you would prefer that method over a smartphone app. Do not feel obligated to use this method of giving. If you have a system that is currently working for you, by all means continue to do what makes sense for you. We are simply seeking to add to our stewardship toolkit in response to those who have been asking for a direct way to give online. If you intend to give through this platform, note that there is a cost per transaction for giving through this platform. The most cost-effective way to donate is through an ACH transaction, which simply requires your checking account number and your bank's routing number. If you choose to give via a debit card or any other type of card, there is a higher transaction cost to either you or SJotL (2.9% plus 30 cents per transaction for debit cards, compared to only 1% plus 30 cents per transaction for ACH/bank). You have the option to donate an amount without covering the cost of the transaction fee (which would deduct the cost of the fee from the final amount SJotL receives) or to add the cost of the transaction on top of your donation and pay the fee yourself. Given the per transaction cost, it would make more sense to give sizable donations through a more traditional means. Parish Council member Andy Martin will be available with his computer in the teen church school room during coffee hour on the following days to support anyone who has questions or would like help with setting up a Tithe.ly profile. Please reach out to the church at office@stjohnoftheladder.org if you would like to ask questions or require help prior to those dates. Father Gregory Heers, 81, of the Antiochian Orthodox Christian Archdiocese fell asleep in the Lord on June 11, 2016. Father Gregory was born on January 17, 1935 and was married to the former Catherine Platos for 52 years. Father Gregory is survived by his sons John Heers and Fr. Peter Heers, daughter Elizabeth Berg, and eleven grandchildren. Father Gregory became an Orthodox priest in 1992 and served Antiochian parishes in California and London, Ontario. Many people from his previous affiliation became Orthodox through his example. He retired in Greenville, South Carolina, in 2005 and attended Saint John of the Ladder (OCA) with Father Marcus Burch as rector. 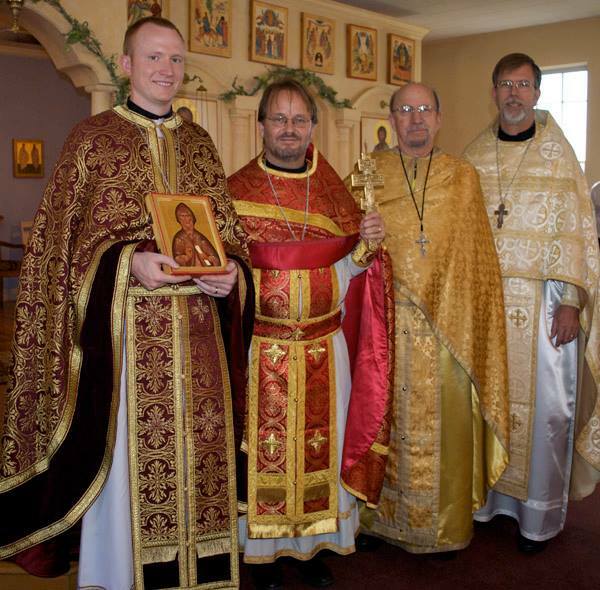 In loving memory of Father Gregory memorial donations may be made to further the church building fund: Saint John of the Ladder Orthodox Church, 701 Augusta Arbor Way, Piedmont, SC 29673, www.stjohnoftheladder.org. May his memory be eternal, and may his soul dwell with the blessed! On April 8, 2016, the reorganized building committee met. The parish council approved the organization chart showing the new committee and support teams. (See above). Jeff Helvey was selected to chair the Building Committee, while he and Rich Eich will co-chair the Construction Team. Kirsten Small is the Project Coordinator. The Construction Team is working on getting the house on the property removed. ECS Carolinas has been selected to complete the required asbestos testing on the house prior to demolition. The site engineers are working closely with the county to finalize the site drawings; we expect these to be submitted to Greenville County no later than April 20. Once we receive the county’s final approval and permit, the completed Site Plans along with Andrew Gould's Building Construction documents will be provided to George Webb at Clayton Construction, who will obtain final bids from subcontractors and submit a completed construction contract for the project. will prepare a finalized contract price for St. John’s approval. The Finance Team, chaired by Bill Wamboldt, is reaching out to potential lenders in anticipation of receiving the construction contract from Clayton Construction. The pre-construction phase of a major building project is always the longest and most frustrating. Your ongoing prayers and support are greatly needed and appreciated. The Building Committee and support teams are working to help facilitate efficiency and transparency. The next scheduled Building Committee meeting will be Sunday, May 8, following liturgy. Tomorrow (FRIDAY, APRIL 22) is the final day for confessions before Pascha; neither Fr David nor I will be available for confession during Holy Week. I am available, as noted on the calendar, from 4:00 pm until a few minutes before6:00 pm when we will begin the Vespers of Lazarus Saturday. I have some limited availability for appointments throughout the late morning and early afternoon tomorrow, as well. Please join us in prayer as we receive our catechumens into the Church through the Sacraments of Holy Baptism and Chrismation on Lazarus Saturday, April 23, 2016 at 8:30 am. Divine Liturgy will be followed by a “Champagne and Caviar" Reception. There are sign-up sheets in the kitchen for reading over the tomb of Christ from Holy Friday evening until Holy Saturday morning. Please sign up for a thirty minute slot (it seems the early morning hours are those now available). Also, we will begin reading the Book of Acts at 9:00 pm on Holy Saturday (all these time slots are accounted for). Finally, as is our custom, we will read a portion of the Prologue of the Gospel of John (John 1:1 - 17) at the Divine Liturgy of Pascha in as many languages as possible. If you are proficient in a language please let me know which language(s) you are able to do, and I will develop a list of readers and languages (there is also a signup sheet in the kitchen). Eg, the following were the languages read last year: Greek, Latin, Slavonic, Tamil, Bulgarian, German, Italian, Ukrainian, Spanish, Russian, Finnish, and Japanese. 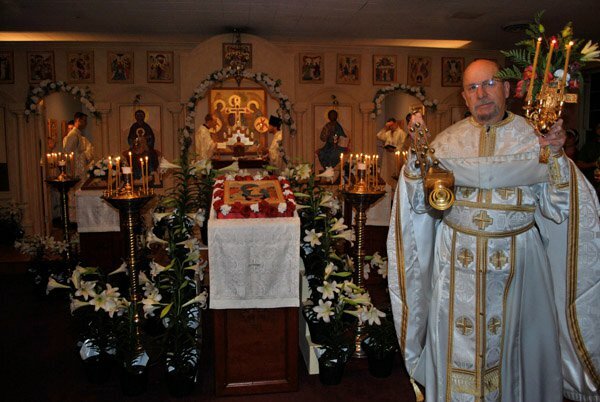 As we are are increasingly crowded at SJOTL, particularly for Sunday Divine Liturgy, Palm Sunday, and Pascha, it is important for all of us to understand our surroundings in the church, and how they relate to other people, and the various liturgical ministries that are going on (Altar Serving, Choir, Readers, Bellringers, et al). First, please make every effort to remain in the nave once you have entered, leaving only for a 'cause worthy of a blessing'. Because of the relatively small space, hinges on the doors, etc., this 'coming and going' becomes very distracting over the course of service. Second, if you are not singing in the choir, please do not stand behind the choir during services; rather move somewhere more forward where there is more space (see the fuller note from our choir directors appended below). Also, especially for the heavily attended services like the Divine Liturgy and Pascha, unless you are a singer, and are fully prepared to sing for the service you are attending, do not stand in the choir area, or sit in the pews around the choir. Parents that have children with them, please make sure they are being tended to and older children should not be in the choir area at all unless they are singing. Finally, during this Great Lent which is rapidly coming to a close, we have been praying that the 'Lord and Master' of our lives would take from us "the spirit of sloth, despair, lust of power and idle talk". With everyone having confessed their sins before Christ, it is especially important that as we approach this final days before Pascha that we turn our attention to the second portion of this prayer: "...give rather a spirit of chastity, humility, patience, and love", and particularly how we show these and practice these toward one another. If we can focus on these things in light of Christ's saving passion and His resurrection from the dead, we will surely not be far from the Kingdom. I wish you all a blessed celebration Feast of Palms, Holy Week, and Lord's Pascha! The Life of St. Mary of Egypt, celebrated on this weekend in Great Lent, is often cited as an example of a great spiritual athlete. St. Mary indeed spends many decades in the desert, fasting, praying, repenting. She is transformed from a drunkard and prostitute into one of the greatest saints of the Church. But it is very easy to miss the point of her life. She responds to the call of God with every fiber of her being. But the true point is God's call. She had no interest in changing her life when she made her way to Jerusalem from Egypt. Indeed, we are told that she "corrupted" many of the men who were on the boat that took her. The whole gambit of visiting the Cross in the Church of the Holy Sepulcher was nothing more than a game or a lark for her. It is God, through the intervention of the Mother of God in her icon, that reaches out to St. Mary. It is God who brought her to her senses. It is God who directed her into the desert. It is God who poured out His grace on her, making her repentance possible. The message to us is that there are none so corrupt or lost that they cannot be reclaimed and found. The Scripture says, "God is not willing that any should perish but that all should come to repentance." We are nearing the end of our Lenten Fast. It is never too late to hear the kindness of God and to accept His mercy. May God draw us to Himself and grant us the grace of salvation! The new DOS Assembly Website is Live at dosconferences.com! Building on the theme of Expanding the Mission from last year's All-American Conference, our theme this year is Mission Possible: Making Faith Significant in an age of Religious Irrelevance, and our keynote speaker will be Sister Vassa (Larin), world renowned expert in liturgical theology, and host of the popular YouTube Channel, "Coffee with Sister Vassa." There are many events that your parishioners will enjoy attending - the events of the week (along with the historic, coastal location) makes this an ideal vacation. Encourage as many of your parishioners to attend as possible! There is travel and planning information online. Hotel reservations are open now - book soon so that we know if we need to seek another hotel for overflow rooms. There will be childcare provided during two major events, and a list of drop-in childcare options will be provided for other times when it might be needed. There will be a large exhibitor hall with SVS Press books, devotional items, liturgical goods and more for sale - send your bookstore stewards prepared to stock up! Ministries such as YES and the OCMC will be on hand to help parishes learn about ministry and mission opportunities. Please use the registration section at the bottom of the main page, and read the instructions carefully! There are many things to register for, and this is intended to facilitate the laity picking their events a la carte. The youth conference, which will run concurrently with the assembly, and it will be an amazing week for the young people in our diocese! We are bringing in two staff members from Youth Equipped to Serve (YES), part of FOCUS North America, to lead the older group (13-18) in an immersive ministry event. There will also be an event for the 7-12 year olds during this time. Lots of time to laugh, play and have fun at the beach! Our retreat master is Father John Cox, who will help the youth to apply what they learn during the week. More details will be added to the Youth Conference section of the conference website. Registration is FREE (but you have to register on the main conference page by June 15). We hope that you will take Father Gerasim's admonition to use this conference as a time to draw our parishes, families and youth into broader work of the diocese and the Church. Please register soon so that the host committee can adequately prepare for the event. I want first and foremost to ask your prayers and forgiveness as we continue our lenten journey toward the Great and Holy Week and the Three-Day Pascha of our Lord. 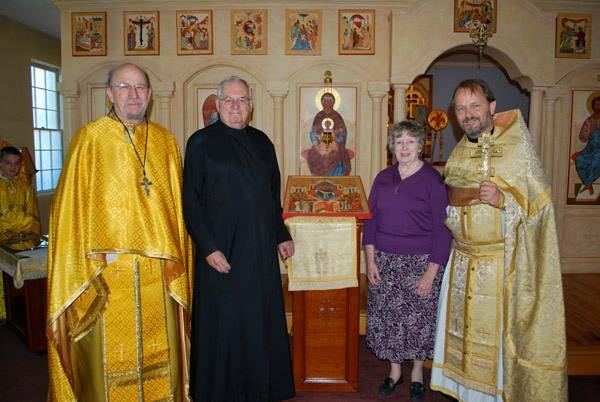 It is not lost on me that as I sit and write this brief reflection it is the seventh anniversary of the retirement of our beloved Archbishop Dmitri of blessed memory. For YEARS now we have been praying in our liturgical services "that the Lord our God, in His mercy and providential care for us, will call forth for His flock a true shepherd of wisdom and strength, blessing us with a Bishop to care for the well-being of our Diocese, and to unite His faithful people in a zealous confession of the Orthodox faith", and yesterday we received the news that FINALLY a bishop has been elected for the Diocese of the South. This is indeed a momentous day for our diocese; a day in which would should "rejoice and be glad". It is also a day, too, that is tinged by something of the "bright sadness" which accompanies this season of Great Lent. We all (or at least most of us) were hoping for a different outcome. Let me be the first to say that I am disappointed. I too had hoped the Synod would accept our nomination. Alas, they have seen fit to provide us with another. While I am am in no way privy to the workings of the Synod, I have had ample opportunity to work with Metropolitan Tikhon in these last weeks leading up to this election. Even not having received my hoped for outcome, I am instilled with the confidence that His Beatitude, as our locum tenens, represented the concerns of our diocese to his brother bishops and worked to garner a consensus on the Synod for our nomination. With this decision made, the "purple demons" of lent will no doubt work to lead many of us to temptation. They will tempt us to feel rebuked and rejected, and this may lead to sadness and anger. We all need, therefore, consciously to strive to see the election of Bishop Alexander as God's answer to our prayer of these many years. In Bishop Alexander we now have as our second ruling hierarch a man who is both a scholar and a monk. More importantly, we have a man who is a gentle and thoughtful pastor, one whom we should receive in joy and gratitude as the fulfillment of God's providence towards us. 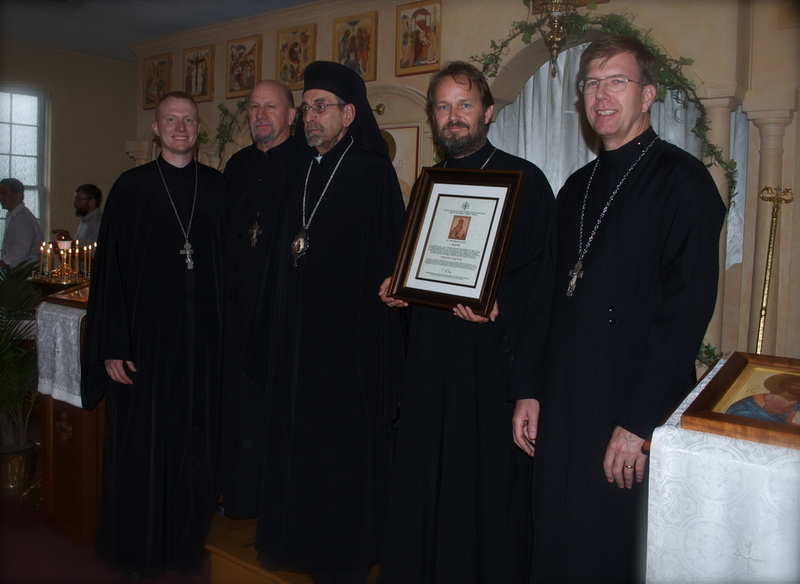 Bishop Alexander will meet with Archimandrite Gerasim, the deans, and me in a couple of weeks' time. There will be more details concerning the transition then. In the meantime, the work of the church continues. Please do not lose sight of this. "I feel confident that with our current Synod of Bishops as well as Diocesan leaders (both clergy and laymen) already in place, that the work of the Orthodox Church in the South will continue. Together we have helped to lay the foundation which is Christ, and now it is time for others to build upon our labors (1 Corinthians 3)." His words have proved true thus far, and it is my fervent conviction that they will continue to do so. If you have any concerns at all, please do not hesitate to contact me.